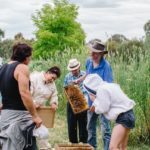 Bindaree Bee Supplies and Wins Creek Meadery are offering a unique beekeeping course. Bindaree will provide instruction on the Art & Science of Beekeeping and Wins Creek Meadery will be catering on both days. What better way to spend a weekend away, enjoying and learning about these fascinating creatures. Whether you have a flow hive, Langstroth, top bar or Warre hive, the principles of beekeeping are the same. Art & Science is a two-day course covering what we know about bees and how to look after them. The Science of beekeeping will cover bee genetics, biology and disease control. The Art of beekeeping involves actual hands on experience working with these animals and constructing the frames and hives for them to live in. Four course dates are offered with a limit of 10 people per course. Course attendees get priority bookings for honey bee colonies to start their new adventure. For the November and December courses, you could bring your hive and bees home with you after finishing the course. Short and sweet two hour course, designed to give you first hand experience working with bees. Find out what goes on in the hive and how to manage these fascinating creatures. Honey is pure raw energy, produced from hundreds of thousands of flowers and tens of thousands of bees. In this course, we'll suit up, collect honey frames and bring them into the shed for extraction. We'll go through uncapping, spinning, and filtering of the honey and explain the steps involved in rendering beeswax to produce exquisite hand made candles. We'll demonstrate how to do a health inspection and prepare your hives for winter. Finish with a tasting of honey and mead. The course is ideal for anyone just starting in beekeeping or wanting to gain more experience and confidence looking after these fascinating creatures. Suitable for adults and older age children. Covers Langstroth, Warre, Top Bar and Flow Hives. It's not necessary to have previously taken the Art & Science of Beekeeping Course. Starts at 9:00 and finishes at 3:00. Morning tea and lunch are included. We'll do the beekeeping in the morning when it's cooler. This course is organised as part of National Science Week, 12-20 August 2017.